Discovering new restaurants is always nice, but really, it’s the old standbys that never fail to answer specific cravings. One restaurant that never fails to satisfy me is Pho Hoa. Whenever I go there, I just take a cursory glance at the menu. A ritual I don’t know why I bother with, since I know I’ll be ordering a Pho #4, in either light or small bowl, depending on my appetite. 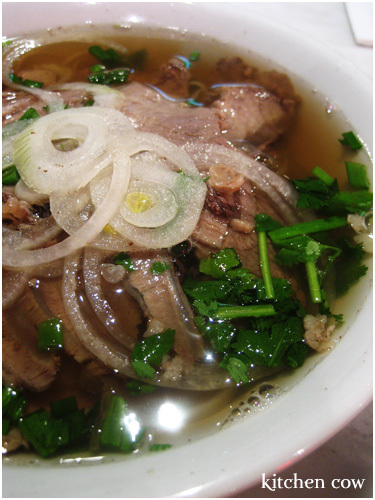 Pho #4 is actually the Pho Chin Nam, a beef noodle soup with fat glass noodles laden with slices of beef brisket and flank, spring onions, parsley and onion slices. A very flavorful dish in itself, the actual noodle soup is just half the story. Sitting down to a bowl of Pho is a ritual in itself. As I wait for my food, I usually prepare a dipping sauce of Sriracha, an extremely hot chili sauce from Thailand and hoisin. 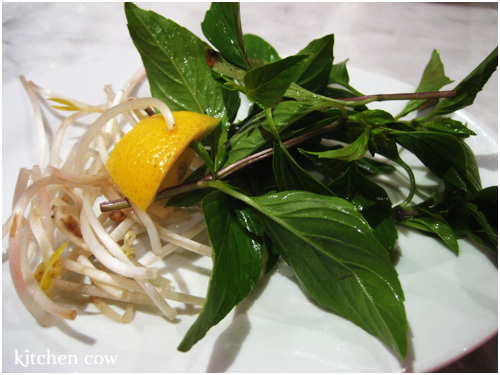 At this point, they usually serve a dish of fresh bean sprouts, sweet basil, a lemon wedge and some chili slices. When the noodles arrive, I strip the leaves off the basil and dunk it in my soup, along with the bean sprouts and chili, before squeezing the lemon wedge. While some people would probably have having to undergo several steps before eating, for me, it feels soothingly ritualistic. What follows is a hearty mÃ©lange of flavors and textures, the refreshing mint mingling with the tang of lemon. The hot chili adding more depth to the already flavorful broth. The firm glass noodles offering a nice, soft yet resilient texture against the crisp fresh bean sprouts. 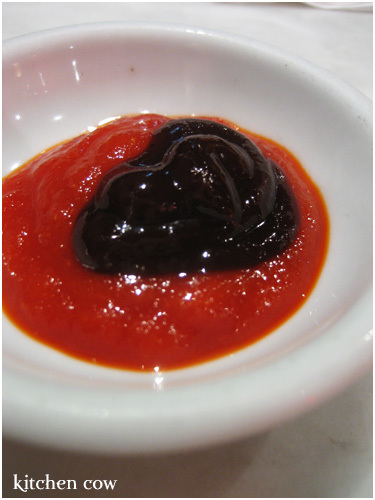 The extremely hot sriracha â€“ hoisin mix coating the beef slices I dip in it with a fiery hot sharpness. Bite after bite is satisfyingly hearty and comforting. Even on a hot day, I won’t be able to turn down a bowl of Pho. Last time I had some Pho, I also tried their Ca Phe Sua Da. 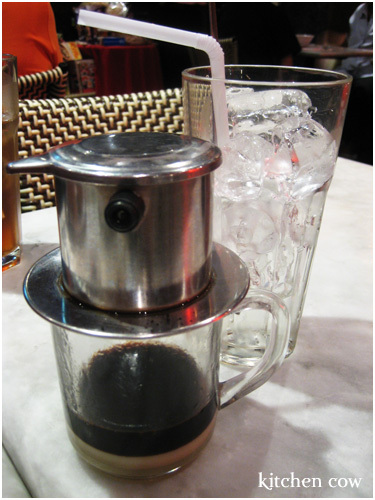 This is Vietnamese coffee, served in a special drip container. It’s made of two chambers, the upper part holds the coffee, while the glass that catches the dripping coffee at the bottom holds condensed milk. I was served the coffee in this pot, along with a tall glass containing ice and a spoon. Honestly, I was quite embarrassed because I didn’t know how to go about preparing it, but it was embarrassment that was worth it because it was such a delicious, creamy glass of iced coffee. Of course, Pho Hoa isn’t just about noodles. They also have great dishes, as J attests. He’s a big fan of their Bun Thit Nuong Cha Gio, a meal that combines grilled pork, special fried rice and fried spring rolls. The grilled pork has that appetizing smokey flavor that screams barbecue. 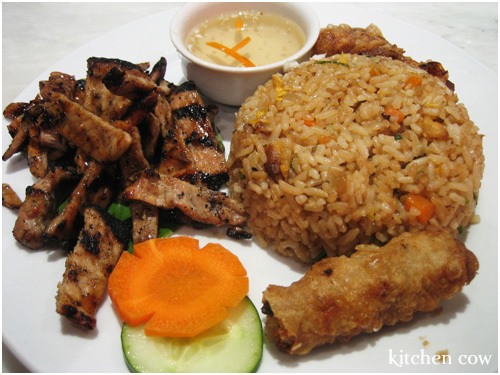 The spring rolls are flavorful and satisfying and the special rice serves as the perfect complement to everything. Of course, while I love swiping bites of this dish off J’s plate, it’s still a bowl of Pho for me. I’m interested in that coffee… so do you pour the coffee + condense milk to the glass with ice or do you put the ice into the glass with the coffee and milk? Pho lover here too! 😉 My daughter just started getting into Vietnamese food and we made Pho at home recently. It was slurplicious! Haven’t been to Pho Hoa in a while. Hmm. There’s one in Paseo Center so that’s a must go to place soon in my book. I love their spicy cuttlefish! I should try the pho sometime. My boyfriend and I went to a Thai restaurant for dinner last night, and he got the pho. I tried some and it was very good! I think I’ll get that next time we go! Balik na! You know you want to! Hehehehe. At least that’s something to look forward to after you get back. Yeah, Pho hoa is absolute love each and every time. I LUV Pho Hoa. I can always rely on it for a healthy, hearty meal. Sorry if the comment came off as meaning something else…didn’t realise not all of my comment came up D: I remember writing about the awesomeness of the coffee.. I was curious, is it just mainly pho? Or is there any other dishes? :o? Ah, no wonder it sounded like a weird comment. ^_^ No damage done! I am writing to you to inform you about the incident that happened at PHO HOA ATC on August 19, 2008. Together with my mother, and my assistant, we decided to have lunch at PHO HOA ATC around 11:05am. When we arrived only two customers were there and we waited for 5 minutes for the server to approach us to take our orders, but it seems that your servers are preoccupied with other things and we have to call her attention. A Nancy (which was on her name tag) approached us and took our orders. We ordered for fresh spring rolls, stuffed chicken wings, seafood soup, another kind of soup and vermicelli bowl, 1 coke and 2 iced teas. While waiting for our food, I noticed that there are other patrons coming in at the restaurant. The dirnks were served first. Ten minutes after the spring rolls arrived followed by the stuffed chicken wings. The three of us were so engrossed in conversation, when I checked my watch 20 minutes have passed and the rest of our orders have not yet arrived. So I followed it up with the male server and the seafood soup was served 5 minites after my first follow up. Five minutes have passed again the other soup arrived. At this point I noticed that all the other patrons of the restaurant who arrived after is already eating their meals but we were there first. I followed up again on the vermicelli bowl and Nancy told me that they were having problems with their griller. I told her how can that be since another patron is already eating something that is grilled???? I told her to prioritize my order, however, the order of the other patrons who arrived later than us were served first despite my follow up. Finally, after more than 30 minutes, the vermicelli bowl was served. I asked the male waiter if they can replace my soda since it took such a long time for my food to arrive the soda has gone stale and warm already. The male waiter did not react to my request, so I called his attention again, and he told me that he will ask the supervisor (Nancy). When the soda arrived, a coke in can, a glass with ice, I poured the coke in the glass and started eating my lunch. I was already taking a sip from the glass when I noticed something foreign touched my lips, when I looked at the glass I saw some gelatinous substance and my first thought it is spit or phlegm!!!! I showed it to my assistant and he reacted and called the attention of the staff and told them â€œBakit my dura itong binigay ninyo na baso? !â€ The female staff, supervisor Nancy, insisted on taking the glass from my assistant and in replacing it. He refused to give her the glass and told her that he will complain it to the Administration of ATC. I was given another set of coke in can and a glass with ice. My assistant went out of the restaurant to ask assistance from the customer service of the mall but he was only able to get hold of a security guard. While my assistant is out looking for the administration office, my mother and I stayed at Pho Hoa to wait. While my mom and I are engrossed in a conversation, the male waiter sneaked from my back trying to sequester the glass with spit! I raised my voice and told him I did not permit them to take the glass because it is going to be my evidence! The security guard came and we showed him the glass and he told the staff that he will accompany us to the security office since there is no one in the administration office at that time and we will take the glass with spit with us. At the security office, the security officer took our statements and he asked someone from his office to call the staff of Pho Hoa to get their side but Nancy refused to cooperate with the security officer. This incident clearly raises doubts on the restaurant’s sanitation and safety system. It’s unfortunate that this has happened to you. Such an incident should never happen to anyone! I’m especially horrified at the spit issue. I always thought stories like that were urban legends but then, your experience suggests otherwise. Aside from talking to the mall management, perhaps it would be good to complain to the restaurant’s management as well? Their contact information is here. It would be awful if a good restaurant were to go down because of negligent staff. Yes I already complained with Pho Hoa’s management, aside from that they are already aware of the incident. It is very disheartening because I really favor this restaurant, in fact I am a regular there, I have my lunch one or twice a month at that restaurant. I even entertained the Prosecutors of Las Pinas at that restaurant a couple of times in the past. It is unfortunate that this incident happen to you. I know the management of Phohoa and I have spoken with them. There has been a rise of such MODUS OPERANDI in the area. ATC and merchant owners have been warned TO BE VIGILANT against these type of customers. There has been proof already that these people just want to extort money from management. For complaints of this kind, there is a due process, and investigation follows immediately with your cooperation of course. In this case, the person you mentioned have been with the company for several years and is a good employee. The reason that they may want the glass back is to investigate the matter and check if indeed there was a foreign matter and if truly it came from them and not from any other person (not Pho hoa staff). The best way to resolve this matter is to bring it up with ATC and to the Pho Hoa management. Attorney: First of all is that your name or just a title? Nevertheless, the reasons that you have enumerated in your comments are the usual defense mechanisms of restaurants who had been involved in this kind of incident. They will resort in saying that these things are planted or manipulated by custormers just to get away with it. Have you been in the store? Basically you will see everything that is going on in that small area, and is this one way of accusing me of trying to extort money from the management of Pho Hoa? I’m sorry but I will not resort to that degenerated action. Point one – you are saying that the employee has been with the company for a long time, to hell with that! She can be there forever and if she wants to do something awful to the customer no one can stop her from doing that not even you. Point two- If I had given the glass to the staff do you really think there would be justice? She won’t even apologize to what happened. I did what has to be done, I filed a complaint hoping to resolve the matter but It has already been five days since the incident happened and at this point in time no one from Pho Hoa or ATC’s management has done anything to resolve this issue. An incident report has been filed with the ATC’s Security Office and the security officer has already forwarded the incident report to the Administration of ATC the day after the incident for action. Unfortunately, I have been calling and following it up with them but they were eluding me. I even called up the Head Office of Pho Hoa to air out my complain but no one from the management has done any action regarding the incident. Point three – I have already sent the specimen to a credible laboratory for microbiological testing and to confirm if that foreign matter is indeed saliva or phelgm, if that will be the result, my next step would be to send that specimen to St. Luke’s for DNA testing and that would definitely exclude myself, my mother and my friend who was with me from purposely doing it to extort money from Pho Hoa. A simple DNA test would determine whose saliva is it and my next step would definitely be a legal one. Isn’t it the PROTOCOL of restaurants with this kind of case to get the specimen so that there would be no evidence available to the customer? To be objective about this no one really knows if it is phelgm, saliva or whatever, but what was breached here is that there is a foreign matter in the glass which should not have been there and that violates food safety and sanitation practices!!! I appreciate your feedback and hope that you could be objective regarding your opinion. Inasmuch as I would like to see a resolution to this, I don’t think the comments section of my blog is the proper avenue for this discussion. I hope neither party minds if I lock this thread already.